OBESITY is a “global epidemic,” according to the World Health Organization. Two thirds of American adults and one third of school-age children are either overweight or obese (defined as extremely overweight). These proportions have been rising steeply, report the latest surveys. From 1960 to 2002 the population of overweight and obese adults increased by roughly 50 percent, and the corresponding increase for children was 300 percent. Compounding the problem, obesity rates in other countries are rapidly approaching those in the U.S.
What is causing this pandemic, and what can we do about it? Researchers have provided some tentative answers that fly in the face of commonly held beliefs. They suggest that the increase in obesity may be a result of environmental changes that tempt us into unhealthy habits and tend to overwhelm our psychological defenses against consuming too much and succumbing to fattening fare. In fact, environmental cues can exacerbate any innate tendency to use food as a balm for jittery nerves or sadness. Thus, many health experts advocate legislation—for instance, a tax on junk food—that promotes healthy eating. Others are trying to help individuals change their immediate eating milieu in ways that discourage overeating. Many people, including health care professionals, believe that obesity can be attributed simply to a lack of self-control or willpower. It is true that obese people are often unable to adequately control their eating. But lack of self-control is merely a description, not an explanation. What remains to be explained is why they cannot exercise self-control. Nevertheless, doctors routinely tell their obese patients to restrict what they eat. Diet books, articles in health magazines and on Web sites, and commercial weight-loss programs also encourage people to eat less and exercise more. Unfortunately, approaches based on self-control do not seem to work very well. As sales of weight-loss books have climbed recently—from 3.6 million copies in 2005 to 4.8 million in 2007—so has obesity. Further, two thirds of those who slim down in weight-loss programs regain their weight within a year, and almost all have put back the pounds within five years. Other explanations of the increase in obesity are based on genes and psychological factors. It is true that many people are predisposed to gain weight because of their genetic makeup. But genetic factors cannot account for the sharp increase in the prevalence of obesity in society. The genes within a population relevant to weight do not change appreciably in 50 years. Some psychological factors may also play a role in obesity, including impulsivity, anxiety and a tendency among some people to eat during negative emotional states. But here, too, there is no reason to believe that these characteristics have become more prevalent in recent decades. Therefore, genetic and psychological factors cannot account for the rise in obesity. Results of a large number of studies support the conclusion that environmental cues exert a powerful influence on our eating behaviors. And unlike biological factors, our nutritional environment has changed radically in the past 50 years. In various publications, Yale University psychologist Kelly D. Brownell has used the term “toxic environment” to refer to this new dietary atmosphere, which is characterized by pervasive exposure to food that is energy-dense, heavily marketed, cheap and widely accessible, accompanied by a lack of physical activity. A 1995 report by the Institute of Medicine set the stage for future work when it concluded that the root of the obesity problem “must lie in the powerful social and cultural forces that promote an energy-rich diet and a sedentary lifestyle.” More recent studies have borne out this statement. These forces, Brownell postulates, include the explosion of fast food outlets, increasingly large restaurant portion sizes, “all you can eat” buffets, the proliferation of mini markets that sell high-calorie snacks and drinks, contracts between schools and fast food and soft drink companies to sell their products in school cafeterias, and widespread powerful food advertising. Given the importance of the environment on obesity, many researchers, including Brownell, argue that we need new laws and social policies to combat obesity. Brownell’s controversial proposals suggest, for example, regulating food advertising aimed at children, prohibiting fast foods and soft drinks in schools, and subsidizing healthy foods. Taxation is another potentially effective means of reducing consumption of harmful products, as the tobacco tax has demonstrated. Brownell and Thomas Frieden, who now heads the Centers for Disease Control and Prevention, have argued for a tax on one of the biggest contributors to obesity: sugar-sweetened beverages. Recently the U.S. Senate Finance Committee recommended such a tax to help combat obesity. Although major soft drink corporations vehemently oppose such a tax, the proposal is now on the national agenda. Cornell University researcher Brian Wansink and his colleagues have found that cues in our personal eating environment also exert pressure on our tendencies to overeat. Based on these findings, they have suggested various ways of altering our environment to influence us to eat less. They advise, for instance, reducing portion sizes, keeping tempting food out of sight, never eating directly out of a package, and asking waiters to remove the chips or bread from the table. Analyzing the power of environmental influences on obesity can lead to many practical suggestions for lessening their detrimental effects and encouraging lifelong healthy eating. And because obesity is a serious problem that has managed to spread to many corners of the globe, we must explore every possible avenue to reduce its prevalence. Note: This article was originally printed with the title, "Environment and Weight." Obesity: Responding to the Global Epidemic. Thomas A. Wadden, Kelly D. Brownell and Gary D. Foster in Journal of Consulting and Clinical Psychology, Vol. 70, No. 3, pages 510–525; June 2002. Food Fight: The Inside Story of the Food Industry, America’s Obesity Crisis, and What We Can Do about It. Kelly D. Brownell and Katherine Battle Horgen. McGraw-Hill, 2003. Handbook of Obesity Prevention: A Resource for Health Professionals. Edited by Shiriki Kumanyika and Ross C. Brownson. Springer, 2007. 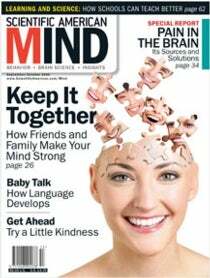 HAL ARKOWITZ and SCOTT O. LILIENFELD serve on the board of advisers for Scientific American Mind. Arkowitz is a psychology professor at the University of Arizona, and Lilienfeld is a psychology professor at Emory University. The authors thank Kelly D. Brownell of Yale University for his invaluable help with this column.